Kabo Airlines has suspended its pilot who made an emergency landing at the Sokoto Airport Friday, last week...see the full story HERE. 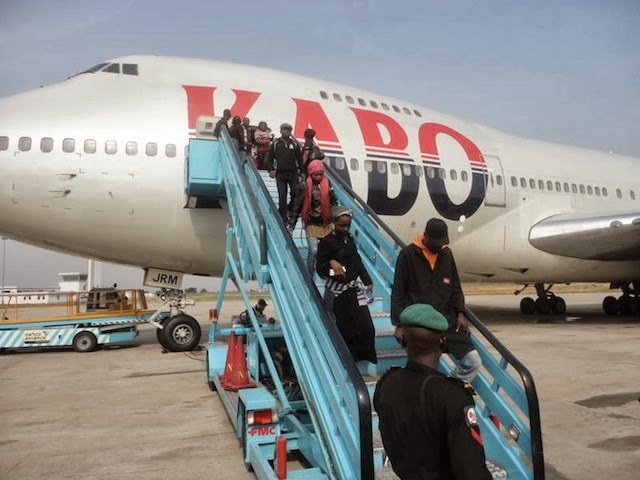 The Kabo plane was conveying 512 passengers from Kano Airport , en route Saudi Arabia when it had to do an emergency landing at the Sokoto Airport. After the plane landed, it was discovered that its tyres were deflated and it damaged some parts of the instrument landing system at the airport. The pilot also did not comply with the directive given by air traffic controller on duty that the plane should land on runway 08 , but rather diverted to another runway. The passengers on board who were on pilgrimage to Mecca were safely evacuated and subsequently transferred to another aircraft which took them to their destination.